Over the last three years, the Feed the Future Accelerated Value Chains Development (AVCD) program through the International Crops Research Institute for the Semi-Arid Tropics (ICRISAT) has supported the development of drought-tolerant crop farming in several semi-arid counties across Kenya. These crops include sorghum, pearl millet, pigeon peas, groundnuts, finger millet and green grams. AVCD has supported farmers in these counties with certified seed, training support in good agricultural practices, post-harvest management, marketing and linkages for input and credit. At the beginning of the rainfall season this year, several development partners came together and supported farmers with ample seed. Also, as an effort to address the frequent droughts in these and other areas of the country, the national government and county governments intensified distribution of seeds of drought-tolerant crops. Through these efforts and with the good rains experienced across the country, we anticipate that crops yields projections will surpass the two-fold national record harvests in one season. With such a good harvest the immediate challenges for farmers will include post-harvest management, storage, and more importantly marketing of these crops. While some crops such as sorghum have ready buyers in the beverage manufacturing sector, for example, others such as millets, and green grams do not have a well-developed marketing system. Of particular focus in the southeastern region of Kenya are green grams, locally known as ndengu. This region produces over 95% of the country’s green grams. Development partners and the national government have included this crop in their seed distribution program and promoted it not only as a food crop but also a cash crop. Some local leaders, in particular, the governors of Kitui, Makueni, Tharaka Nithi and Meru counties have embraced this development and announced a ‘Ndengu revolution’ in their counties. On average Kenya produces a total of 103,000 metric tons of the grain a year, and consumes about 121 metric tons. In the four counties, it anticipated that at the closure of this harvest period, ending in July, farmers will have harvested 95,000 metric tons of green grams. 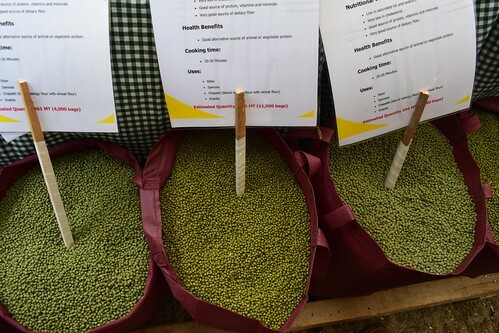 Poor post-harvest handling: Given the vast quantities of green grams produced this year, farmers may use poor methods of harvesting and drying, due to lack of knowledge resulting in low qualities that cannot draw favourable prices in the market. Lack of storage facilities: While there are suitable storage technologies such as hematic bags, farmers may not afford to buy and use them. Furthermore, even after putting the harvest in bags, there is no storage infrastructure at the county level for storage of such vast volumes of crop. Lack of crop development and marketing institutions: Currently farmers are not structurally organized to store and negotiate as groups for reasonable prices. Buyers are therefore taking advantage of the situation and moving from household to household giving poor desperate farmers meagre prices. Lack of a national, regional market or export market: In the past, Kenya has been a net importer of green grams; hence there was no issue of a market. All over a sudden, the country has produced a considerable surplus. There is, therefore, a high risk of a glut in the market and hence a considerable loss. It is against this background that the United States Agency for International Development (USAID)-funded AVCD program convened a meeting with selected governors, county executive committee members responsible for the line ministries, ICRISAT (the implementing partner of AVCD drought-tolerant crops component) and Farm Africa to establish an immediate way forward to address these pressing concerns. The AVCD program is, meanwhile, organizing marketing forums in project counties of Kitui, Makueni, Meru and Tharaka Nithi to bring together producer representatives, aggregators, buyers for trade and processing, Department of Trade, credit institutions, input sellers (seed, threshers, tarpaulins and hematic bags) and local traders to discuss and agree on prices, product quality, supply and demand quantities for the green grams. We anticipate that by bringing together county governments, ministry officials, development agencies and farmers groups market, and other efforts, solutions will be found that not only address the current anticipated green gram glut but that also jump-start the green gram value chain across Kenya. Finding shared solutions to these challenges illustrates the ability to leverage stakeholder strengths that can support the growth and sustainability of the sector so that farmer’s needs are addressed. Tags: Collective action, Kenya, markets. Bookmark the permalink.